From the heights of the Tibetan Plateau, the mighty Mekong flows through six countries, giving life and a home to millions of people. For this, it was once named “Mother of all rivers”. After a journey of 4,350 km (2,700 miles) it reaches the Pacific Ocean. Our boats combine regional boat-building traditions with modern comforts. 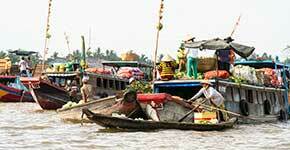 Both boat types were built and artfully decorated by skilled craftsmen of the Mekong Delta. With our fleet of luxurious river cruisers, Mekong Eyes Explorer, Mekong Eyes Classic, Dragon Eyes I and II and our private boats Gecko Eyes, we offer the perfect holiday vessels to cruise the Mekong in style! You can send us an e-mail or fill in the following form. We are looking forward to your inquiries and will get back to you shortly. Please complete the following form, so we can send you a detailed tour description and availability status.